Seit Jahren sprengt sich der kleine Bomberman immer wieder aufs Neue in unsere Herzen und hat mit seiner explosiven Art schon so manche Freundschaft auf eine harte Probe gestellt. In seiner GBA-Premiere übertrifft sich der untersetzte Wichtel mal wieder selbst - Bomberman Tournament gehört zu den mit Abstand besten Spielen für Nintendos Handheld. No game system should be without Bomberman, and Game Boy Advance will probably see several games in the series over its lifetime. The first is Bomberman Tournament, and if games were people and I was a psychiatrist, I’d say BT had a split personality. The main menu has two choices, and those two choices define the entire game: Quest and Battle. Mit Bomberman Tournament hat Hudson ein echtes Kleinod für den GBA geschaffen. Zwar liegt wie in der Vergangenheit das Hauptaugenmerk auf dem Mehrspielermodus, doch dank einiger netter Ideen und der sehr stimmungsvollen Atmosphäre überzeugt diesmal sogar der Solo-Anteil des Spiels. Nach mehr oder minder gelungenen Versionen für die alten Game Boys gibt es für den GBA endlich eine rundum überzeugende Bomberman-Version. Für Freunde intelligenter Action ist Bombermam Tournament ein Muss - selbst wenn du schon einen der Vorgänger für eine Heimkonsole besitzen solltest! All told, Bomberman is still Bomberman, and fans of the multiplayer game are going to be pleased with this title no matter how much they actually play with the weaker single-player quest mode. It's still fun running around and laying bombs with a bunch of friends, all huddled around a powerful light source and connected by link cables. That's what Bomberman, is all about. Regardless, it’s a Bomberman game with both a decent one-player mode and the multiplayer we’ve grown to love in one awesome package. Bomberman fans are advised to pick this up instantly. Newcomers to Bomberman may want to rent before committing but it is certainly a perfect introduction to the series. While many titles for Game Boy over the years have taken extreme cut backs to deliver solid gameplay, Bomberman Tournament is able to do match it’s classic predecessors visually and audio wise without much need to condense areas for the portable format. Though there is no pause option available in the battle mode, it may not effect you quite as much with Game Boy Advance, as you’ll be able to hit the bathroom, without having to forfeit the game. However, playing while linked to other partners…does present something of a challenge during this situation. Bomberman has been a classic favorite among many gamers, but how does it hold up in handheld form? With its simplistic gameplay, Bomberman is perfectly at home on the Game Boy Advance with Bomberman Tournament. Not only is the multiplayer game addictive as always, but you also get an RPG-ish one-player adventure to boot. Although Hudson has left the door wide open for a sequel thanks to the omission of key multiplayer options, Bomberman Tournament is easily the best Bomberman to hit these shores since Saturn Bomberman in 1997. Socialites who have been aching for an excellent multiplayer battle game would be silly to pass this one up. By the same token, 20 hours of fine-tuned single-player gameplay and a jaw-dropping end sequence make this an excellent game for the antisocial among us as well. 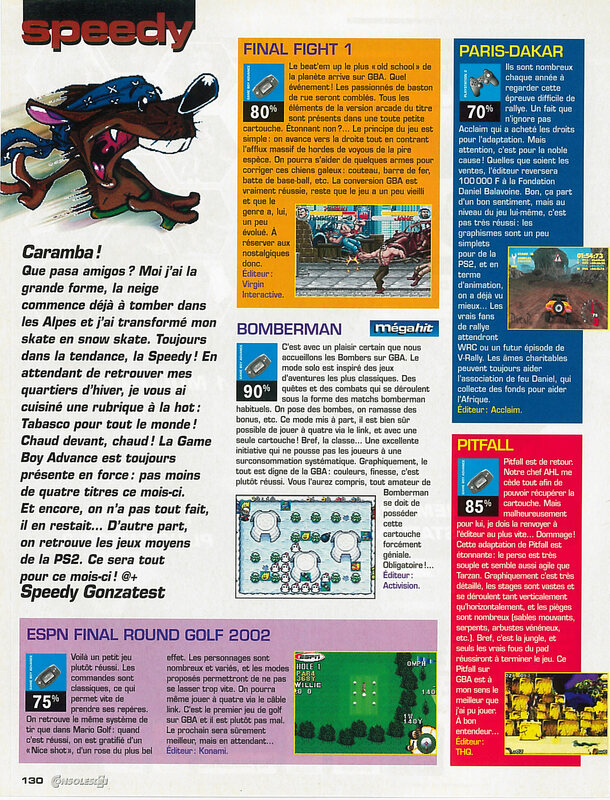 En résumé Bomberman Tournament est un titre au fort potentiel. Que ce soit en mode quête ou en mode bataille, il s'avère très attrayant dans son principe et dans son gameplay. Ce sont au final de nombreuses heures de jeu qui seront en perspective avec ce titre qui devrait faire le bonheur des grands comme des petits. Simply put, Bomberman is one of the greatest multiplayer game franchises of all time and Bomberman Tournament for GBA does its heritage complete justice and is a must-own game for fans of the series and for those looking for a great multiplayer game for their newly bought handheld system. So, please excuse me while I get my Bomberman on. Infernal et fun (comme d’habitude), le mode multijoueurs est incontournable et justifie, à lui seul, l’achat de la cartouche ! Bomberman Tournament is most definitely one of the best Bomberman games in the series due to it's gorgeous graphics and such addictive gameplay. However it will always be let down by the fact on single player the experience will never be as fulfilling with 4 other players and although the new Quest mode moved to fill the gap, it did not do it as effectively as we might of hoped. Which pretty much sums up Bomberman Tournament. It's nothing we haven't seen before, but the simplistic gameplay and cute cartoonish graphics work well on Nintendo's new hand-held. Solo gamers will miss out on a lot of the fun, but even the single player modes are enjoyable enough. And if you have one or more like-minded friends with a GameBoy Advance then it's a bit of a no-brainer, especially as you only need one copy of the game for the link-up multiplayer mode. Bomberman Tournament macht wie alle Bomberman viel Spaß, am meisten natürlich zu viert. Der Quest-Modus garantiert auch Einzelspielern echten Langzeit Spielspaß! Abgesehen von dem guten Multiplayermodus erinnert recht wenig an den guten alten Bomberman - oder zumindest an das, was normalerweise damit assoziiert wird. Statt dessen hat man versucht, Bomberman mit neuen (wenn auch abgekupferten) Ideen neues Leben einzuhauchen. Aber die Einzelteile guter Spiele wie Zelda oder Dragon Quest Monsters geben in einer neuen Konfiguration nicht zwangsläufig ein gutes Spiel ab. Und trotzdem: Bomberman macht - wenn auch nur in einer bestimmten Tagesdosis - schon Spaß; vor allem Jüngeren. Bomberman Tournament är ett spel som borde passa de flesta. Här finns nämligen både hysterisk flerspelaraction och lite lugnare rollspelsupplägg för den som hellre spelar ensam. Bomberman Tournament is best played in Battle mode with three others using a link cable. Once you've amassed the necessary hardware, there's nothing better than teaming up on a mate blocking him into a corner, before turning on those who helped you, winning the match. Of course if you don't have three mates available, then you can always face off against A.I. opponents. They're surprisingly good as well, even on the 'Easy' setting. There's a range of other options as well and multiple arenas which should keep you playing for a while. Ok, here is my final opinion. DO NOT buy this game if you are looking to play just that multi-player/battle mode because you will be $40 poorer and you will probably be throwing your GBA against the wall. But, if you like Pokemon and Bomberman, then by all means, pick this game up. Multi-player is a great feature of this game because it only requires a single cartridge, but even the value in that will quickly become novelty. Nevertheless, more companies should follow Bomberman’s example…in this respect. So don’t waste your money if you’re not a HUGE Bomberman fan. I was lucky enough to get it for Christmas, but it doesn’t always turn out that way.